The Royal Retreat Resort and Spa Udaipur welcomed 2019 again in its unique distinctive way with the theme “The Rolling Hills”. Apart from the Vibrant Décor, matchless ambience and mind blowing entertainment, The Célèbre Spread of Never-ending food varieties won the heart of crowd. Right from the Starters to the Desserts, every dish was scrumptious. Few to name are Dumba Gosht, Sushi bar, Jalapeno Samosa with Schezwan Ragada, Seafood Balchao, Roasted Duck, Marshmallow Snowman, Frozen Cookies and many more. As a nation that loves to eat, we hold food, and the people who prepare it, close to our hearts. 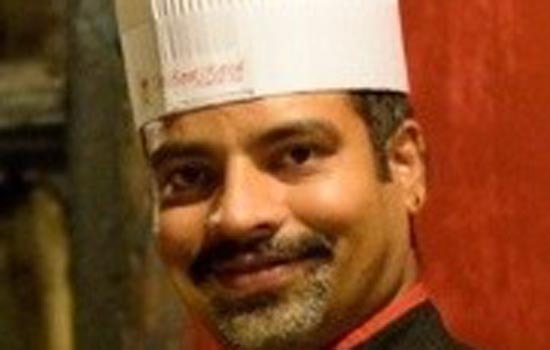 Satish Gupta now fondly known as “Chef Satish” in Udaipur, is the Culinary artist behind the creativity, taste and inimitable selection of various delicacies. He loves to cook, is passionate and selective about each and every ingredient used in his recipes which distinct him from others. He has always believed that “Eating is a Necessity but Cooking is an ART” thereby adding soul to his dishes. 1. Place the seaweed on a bamboo mat, then cover the sheet of seaweed with an even layer of prepared sushi khuska rice. Smooth gently with the rice paddle. 2. Layer fish, cream cheese, and avocado on the rice, and roll it up tightly. Slice with a sharp knife, and enjoy with soy sauce. 	Wash and soak the Chana Dal for 10 minutes. Wash, peel and grate the Suran. 	Finely mince half the Shallots and slice the other half into thin strips lengthwise. 	Crush the Bread Crumbs into a powder. Clean, wash and finely chop the Green Chilies, Mint and Coriander Leaves. 	Mix the Milk with the Corn Flour to a slightly thick smooth paste. 	In a pressure pan mix the grated Suran, soaked and drained Chana Dal, thinly sliced Shallots, Ginger-Garlic Paste with a little Water. 	Pressure cook for 2-3 whistles till well cooked. When cool grind to a paste. Mix in Salt , Turmeric, Coriander-Cumin, and Garam Masala Powders. 	Mix in the finely chopped Shallots, minced Coriander and Mint Leaves and chopped Green Chilies. Adjust the seasoning. 	Soak the Bread Slices in plain Water and squeeze all the Water out immediately. 	Crumble into the prepared Suran Mixture and knead in well, Shape this Mixture into small flat Patties and make 20-24 small Patties. 	Dip these Patties in the prepared Milk and Corn Flour batter, roll in the Bread Crumbs and shallow fry in a non stick Frying pan till crisp and brown on both sides. 	Drain on paper towels to remove excess Oil.